Eugene Obwoya says he grew old in a refugee camp. 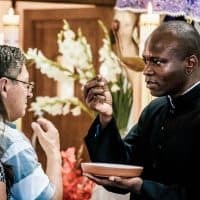 The agronomist and Catholic catechist says he has fled fighting in his native South Sudan three times in his life, all three times to neighboring Uganda. A young South Sudanese refugee girl carries a small child, probably a sibling, in traditional fashion at the Palabek Refugee Settlement in Uganda. Obwoya says he was in his mid-20s when he first took refuge in Uganda to escape attacks by government troops of Sudan who were trying to put down the first war for independence by the South Sudanese. He returned home in 1971, only to be driven out again in 1989 during the second war for independence. He spent the next 18 years as a refugee in Uganda, only going home again in 2007 at age 65. When the largely Christian South Sudan finally gained its independence in 2011 from the predominately Muslim north of Sudan, the new country’s future briefly looked bright. Then, in 2013, the two major tribes governing the new South Sudan—the Dinkas and Nuers—split into what has become a vicious and chaotic civil war. A grandfather and child rest on a tarp on the ground at the Palabek Refugee Settlement in Uganda, which home to more than 36,000 refugees and growing. 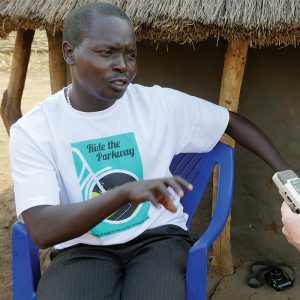 On April 3, 2017, Obwoya and some 7,000 other members of his community, who are mostly of the Acholi tribe and a minority in South Sudan, were literally forced to run for their lives as Dinka government forces attacked the town of Pajok, as part of an offensive against Nuer-led rebel forces encamped 12 miles away. “I took off for my life, because we never knew what would happen to us civilians as the area was generally considered a rebel-held area,” says Obwoya, who escaped with his wife and young granddaughter. 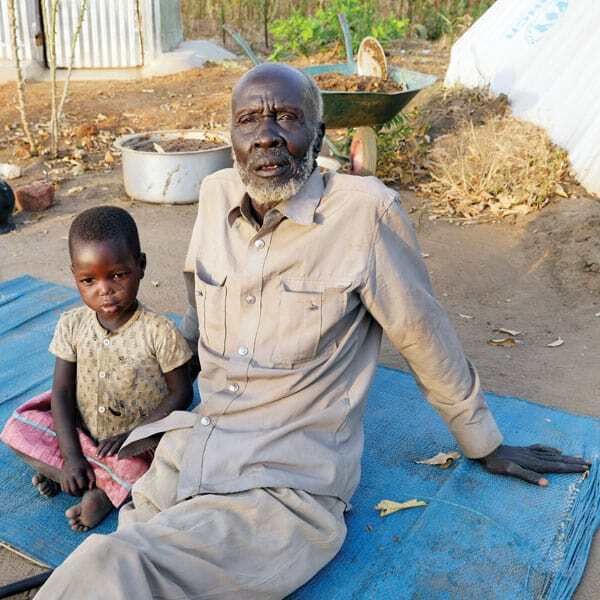 His children and other grandchildren had already left Pajok—located near the Ugandan border—for safer areas in Uganda and other parts of South Sudan. Since then, Palabek, which is called a settlement rather than a camp because it is expected to be a long-term refuge, has grown to 36,000 people. 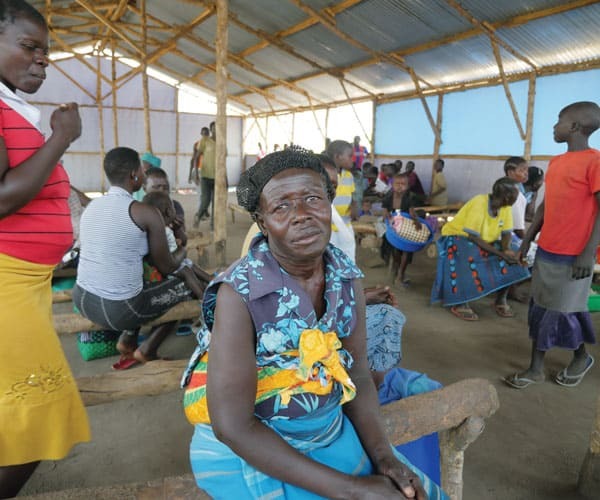 It is one of 15 refugee sites in northern Uganda that shelter an estimated 1 million South Sudanese refugees, as well as more than 200,000 refugees from the neighboring Democratic Republic of the Congo and elsewhere in Africa. 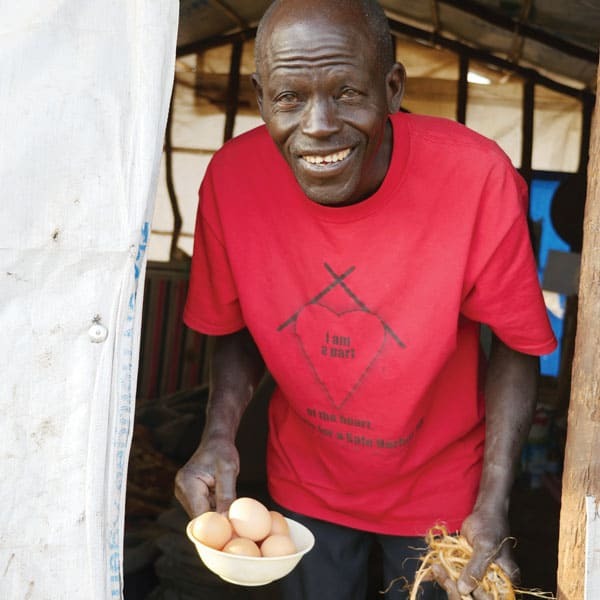 Catholic catechist Eugene Obwoya, a South Sudanese agronomist, gathers eggs from hens that are part of an income-generating program started by the Maryknoll Fathers and Brothers at the Palabek Refugee Settlement in Uganda. 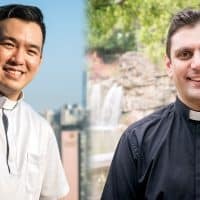 Father Arasu, who began ministering in the camp on the Feast of Corpus Christi last year, has since partnered with Maryknoll Father John Barth to help meet the sacramental needs of the settlement as well as the physical and developmental needs of the community. This includes establishing nursery schools and providing supplies, uniforms and lunches, helping arrange for drilling of wells for water, arranging medical care for the most seriously ill and beginning income-generating projects. 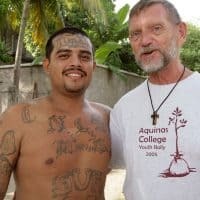 “The camp is just practically overrun with children,” says Father Barth. “Approximately 60 percent of the 36,000 people are below the age of 18. School is a big issue.” To help address that need, Father Arasu’s Salesian order built four nursery schools to care for and educate 200 children each. The Maryknoll Fathers and Brothers is providing these children with uniforms, school supplies and food for school lunches for the next year. A young girl of the Acholi tribe from South Sudan plays at the Palabek Refugee Settlement. “It will be a porridge that’s given to the nursery school children every day, about 800 children,” says Father Barth, who is 65. “This way they’ll have some nourishment in addition to what little they get at home.” He says the United Nations, which helps oversee the settlement, provides the bare essentials, enough for one meal a day. “It keeps people alive but they’re not always satisfied, especially growing children,” says the missioner from Buffalo, N.Y., who moved last year from a parish in South Sudan to Uganda to accompany the refugees. 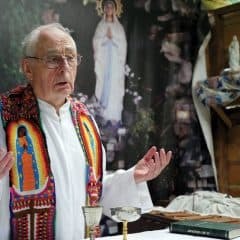 Father Barth returns to South Sudan monthly to bring food to his former parish, where he feeds 1,200 people. 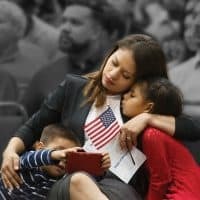 This includes students, teachers and the teachers’ immediate families in an arrangement that keeps the local schools open even though the government has stopped paying teachers and other government employees. 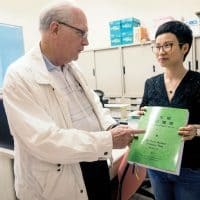 Long term, Father Barth hopes to provide eye care and cataract surgery in the settlement and surrounding area, work he had done successfully in South Sudan and in Cambodia, where he first began his ministry as a Maryknoll priest. At Palabek, Maryknoll has put up two multipurpose buildings that are chapels on Sundays and used for meetings and classes at other times. Father Barth hopes eventually to put up five more multipurpose chapels in the settlement, which is spread out over more than 20 miles. He calls the aluminum and timber structures “a big contribution by Maryknoll,” noting that Masses are regularly said in the open or under trees that provide scant shade in the hot equatorial sun and even less protection in rain. 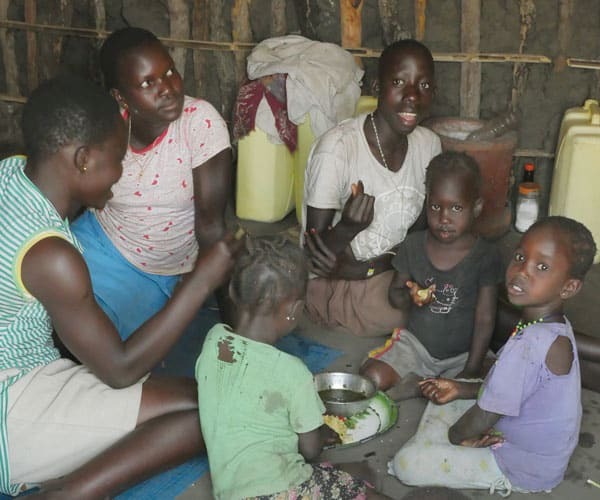 Refugee mothers and children of the Acholi tribe from South Sudan eat lunch in a tukul, a typical mud and thatch hut of East Africa, at the Palabek Refugee Settlement. Refugee Benson Okane explains that when the military attacked, most people ran without stopping to gather any belongings. “When they start shooting people, you just run or you die,” says the 26-year-old father of two small children. “They don’t care if you are a rebel or not.” He says it took two days of walking with children and the elderly, without food or water, to reach the safety of the Ugandan border. 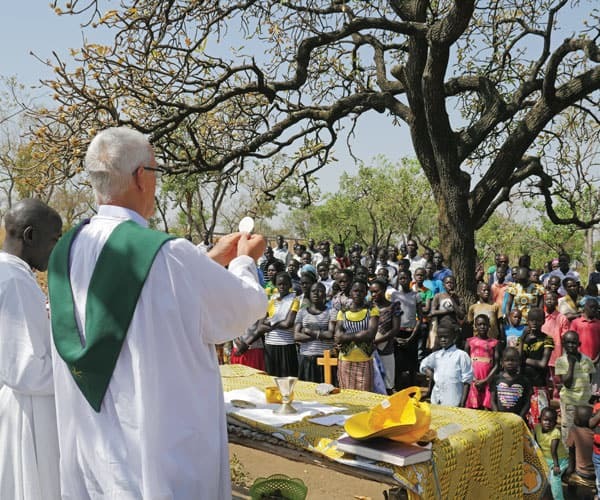 Maryknoll Father John Barth celebrates Mass for refugees under a tree in Uganda. Okane, who fled with his wife, children and parents, stops to talk to a forlorn-looking woman sitting next to a mud-walled tukul, the traditional, cone-shaped thatched hut of East Africa that the refugees are building to replace the white tarps provided by the U.N.
Christine Aparo, 48, who speaks only the Acholi language, tells Okane that she lost her husband earlier in the country’s wars, and was left a widow with four children. She survived by farming. When Pajok was attacked, she and her family ran like all the rest, but her 19-year-old daughter never reached the camp. Aparo now cares for her infant granddaughter and waits, hoping that the child’s mother, her own daughter, will one day appear safe and sound. A South Sudanese woman at the refugee settlement waits for distribution of food. 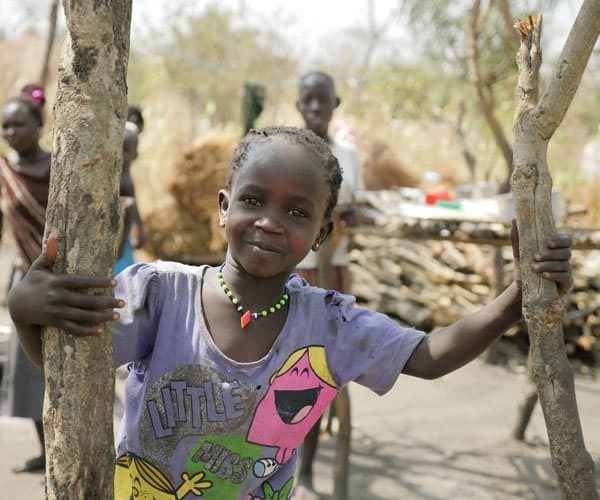 Like Obwoya, many of the people living at Palabek have been refugees before, most in Uganda, which has hosted displaced people during each of the three wars in what is today South Sudan.